There's trolling, counter-trolling, and counter-counter-trolling. And then there's "STFU about Half-Life 3 or I will cut you," as Valve boss Gabe Newell seemed to say in this display of his knife collection. But what does it all mean? That's where you guys come in with this week's 'Shop Contest challenge. Gabe is a regular 'round these parts, and we thank him for providing yet another opportunity. Not only are he and his dual-wield daggers ripe for the more-funny, that screen in the background provides a secondary exploitable. On a shops-itself scale, I'd judge this to be about a 7.5, just because Gabe's pose isn't easily manipulated into another background. But you're creative folk and, hey, a major gaming personality bearing deadly weapons has got to be good for something. 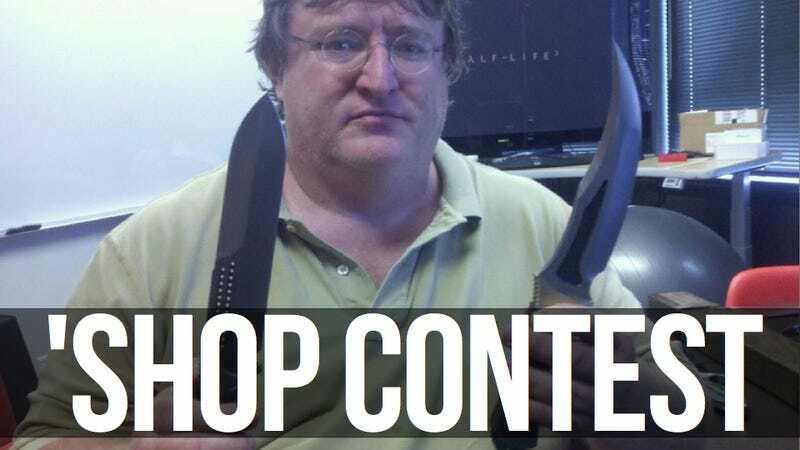 Source Image: Gabe Newell and his knife collection not confirming Half-Life 3. Get it? Got it? Good, that's great. Gentlemen, start your 'shopping!